If you are a bread lover or generally identifies with bread because rice is just not in your league (just kidding! ), you would certainly love PAUL and praise it like it is an oasis in the middle of the dessert. PAUL Maison de Qualité fondée en 1889 (as in founded in 1889) promises quality and carefully maintained family tradition passed down across 5 generations right until this day. The promise, which the brand delivers consistently, explains its continued expansion and growth of fans in 19 countries (and still expanding, I reckon), spread across The United States, Europe, Middle East and Asia (Singapore and recently, Indonesia). In Indonesia, PAUL opened in December 2013 at Pacific Place, SCBD. It has generated quite a buzz among the foodies not just in Jakarta, but also from other cities in Indonesia, as if it is a pilgrimage spot that one must not miss while in Jakarta. I think I'm one of the last ones to blog about PAUL (my other blogger friends had eagerly posted about it early this year), because I've been to the one in Singapore, and I doubted how different they would be. Menu wise, turns out they (PAUL Singapore vs. PAUL Indonesia) are almost identical (if not entirely the same), I can't surely say because I had breakfast in SG, while in Jakarta was a lunch with the family. The moment we stepped at PAUL, the ambiance felt different, just different. I think the kind of patrons they attract (foreigners, expat families, wealthy Asians with their English-speaking and iPad toting kids) played a part in creating such a different atmosphere too. Although it may seem intimidating to some, I felt at ease and actually enjoyed the laid back European feel of the place. The restaurant itself is divided to 2 areas: outdoor alfresco (smoking) and air-conditioned indoor. and you can already guess it: Indonesians dominate the indoor tables (because we melt without air conditioners! Ha!). Roulade de Dourade - dory flavored with paprika. Served with cherry tomatoes, capsicum, alfalfa and creamy tomato sauce. Because dory fish just.cannot.go.wrong.period, It was the safest choice for someone with personal trauma of ingesting smelly / putrid seafood and this dish tasted as good as expected. 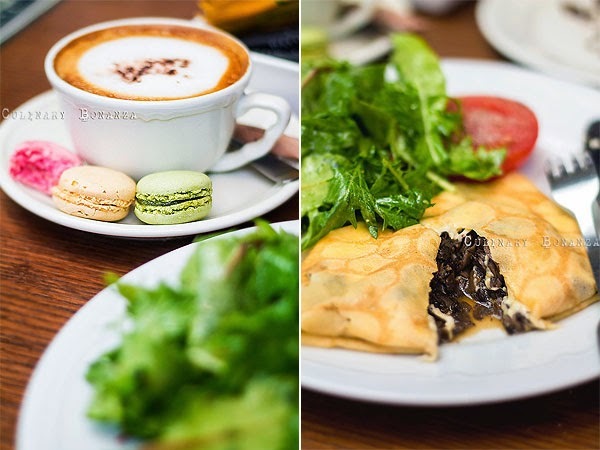 Crepe Champignons - sauteed mushrooms with garlic, shallots and parsley in a thin French pancake. This was my order and I loved it to the last bite. Omelette Complete - omelette (3 eggs) with slices of grilled turkey ham, mushrooms and cheese served with salad, Provençal tomato and potatoes. This was my niece's favourite, she wouldn't let go of our hands until she made sure we stuff her mouth with the omelette. The generous emmental cheese made the omelette gooey and tasty, no wonder my niece was smitten by it. Menu Cafe Gourmand - a set menu consisting one coffee drink (any coffee - I chose Cappuccino) and choice of small sweet bites (I had 3 pieces of mini macarons, which tasted not as impressive as I'd hoped to be). The cappuccino came served in a generous cup, which I almost could not enjoy after stuffing myself with the mushroom crepe. PAUL's Bread and Viennoiserie are top notch, I won't argue that, but the restaurant menu and Patisserie, while they are quite impressive, but at such price tag, I'd consider visiting PAUL as an occasional 'reward' when I feel somewhat richer, once in a blue moon (LOL). 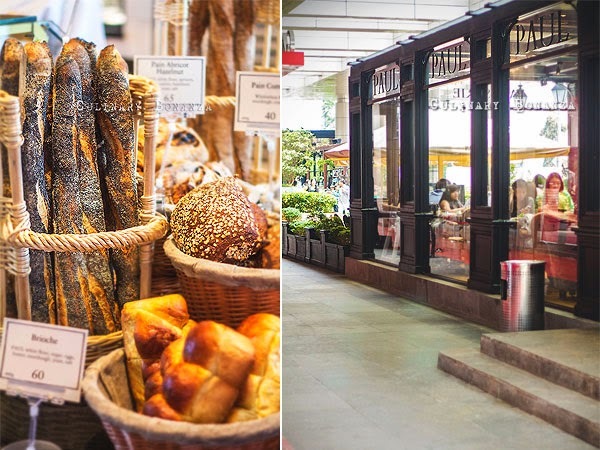 But yes, how I wish I live in SCBD area, because I would really love to grab PAUL's freshly baked bread every morning! *) Prices are subject to 5% Service Charge and 10% Tax PB1. IDR 90K for an omelette?! Maybe eggs are spelled G-O-L-D at Paul. Well anyway, if we use the exchange rate to SGD / USD its actually quite normal.